Here is another Rapunzel "how-to" for creating a cupcake cake, or pull-a-part cake (whichever you prefer to call it). I used a total of 24 cupcakes (12 chocolate and 12 white, tinted pink of course) and 2 sugar ice cream cones (the pointy ones). Arrange the cupcakes on a 12" cake circle. Green, purple, pink, yellow, and some brown or black and some flower or star shaped sprinkles. Rapunzel and Eugene were purchased at Walmart, I think they sell them with Maximus and Pascal as well, but in my little town, they didn't have it! Once the first layer is arranged on the cake board, attached by a blob of frosting on the bottom, use green frosting (buttercream works fabulous) and tip #233. Frost each cupcake by squeezing firmly to adhere the frosting to the cupcake, then pull up in the direction you want the "grass" to go. Repeat over and over again until all are frosted. I frosted the remaining 6 cupcakes while they were off of the base, so the frosting had a chance to "set" a little bit so they didn't smoosh and stick together so much. After all the grass was frosted, I let them sit for at least 30 minutes so they didn't smear when I started to stack and frost the flowers. Place 5 of the cupcakes to create the second layer, break 2 of the wooden skewers to the height of 2 cupcakes, and stick into 2 of the cupcakes to help keep the group together. Add the last cupcake to the center of the 5. Cut one of the sugar ice cream cones so about 1-1 1/2 inches remain (cut the pointy end off). Place cut side down into the top cupcake. Stick a wooden skewer down through the three cupcakes and so it keeps the ice cream cone in place. You might need to use two skewers. Using brown frosting pipe around the top of the ice cream cone to create the "glue" to hold the other cone to it. Place the other cone, pointy side up, onto the frosting on the other cone to create the tower. I then used the flat side of tip #46 to pipe around the seam of the cones and to make a window opening. 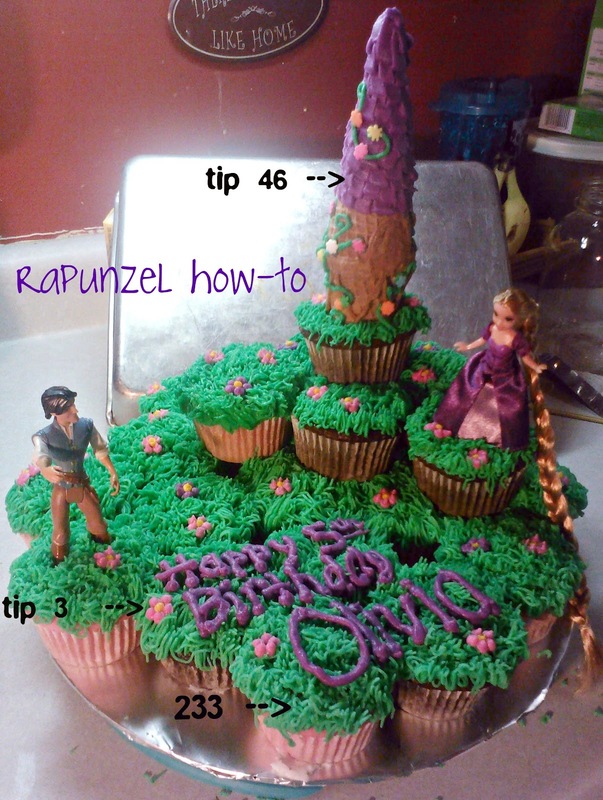 Keep using the tip #46, but purple frosting, and again the flat side of the top to create the shingles to the roof of the tower. Start at where the base of the roof would be and pull straight up to make a square with the frosting, overlapping slightly as you move up and around the cone. Change to a round #3 and rotate colors, pink and purple, to make random flowers around the grassy area. I made 5 small dots to create the flower petals, and then a yellow dot in the center to make the entire flower. 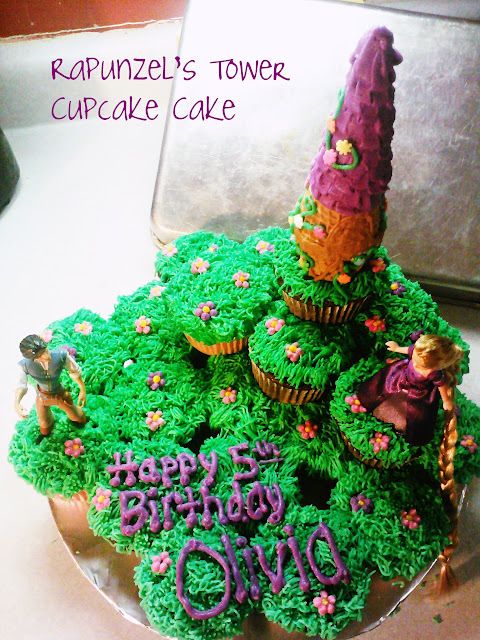 The tower has flower vines on it, so I used some green frosting with tip #3 and created some vines around the tower, and added some flower sprinkles to the green randomly to make this look. (Like I did for Rapunzel's Tower Cupcakes). Add Rapunzel and Eugene and see that little girl's face light up!